Take the first steps necessary to learn to communicate with your pets. Understand what they need and how to help them. There seems to be an emergency in the middle of the night, but you can't get to the veterinary hospital. Or your pet is living with a chronic condition, and veterinary medicine can't do anything more to rlieve it. You're on an emotional roller coaster with worry, fear, grief and an overwhelming sense of helplessness. You wish you could ask your pet to tell you what's wrong. You want, with all your heart, to "Do Something!". Animal Communicator Dr. Monica Diedrich faced this very same dilemma when her two-year-old Shih Tzu was close to death. As she lay on the floor beside him, she clearly heard him say. "You call yourself a healer. . . so do something!" She did as he requested, and he experienced an almost miraculous recovery. It was ChoChop's heartfelt plea which then inspired Dr. Monica to develop this new series of books, For Pet's Sake, Do Something! in each book of the series, she provides a wealth of both spiritual and practical ideas to help you, as pet parents, "Do Something" when you're faced with similar challenges. 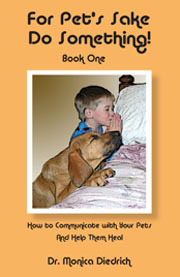 Engage in a real conversation with your pets about everyday things. Discover where it hurts and what do do about it. Use intention and visualization as a catalyst for a speedy recovery. Utilize the healing benefits of aura and chakra energy. Select from among six guided meditations to help your pet heal. Discover your own inner power to use the healing energy of love.